Still, I took the book home, made a pot of coffee and started reading the first chapter. And, sure enough, soon I had to read phrases like “The first team consisted of a ramshackle collection of mathematical mavericks. One of the most colourful was John Horton Conway, currently professor at the University of Princeton. His mathematical and personal charisma have given him almost cult status…” and “Conway, the Long John Silver of mathematics, decided that an account should be published of the lands that they had discovered on their voyage…” and so on, and so on, and so on. The attitude of many professional mathematicians to the earlier book was ambivalent. Although they were pleased that du Sautoy was promoting mathematics, they were not always convinced by the way that he did it. 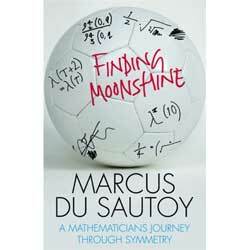 I myself expected to have a similar attitude to Finding Moonshine, but du Sautoy surprised me: he has pulled off that rare feat of writing in a way that can entertain and inform two different audiences – expert and non-expert – at the same time.